We invite you to explore India - the Land with infinite beauty ! Whether you soar high into Himalayas or peer under the ruins of the Ancient monuments dotting the landscape of India, you will cherish the experience long after your visit ! This India Travel Guide on Palani Temple is free from any commercial interest! This site is dedicated to promote India - the vast subcontinent, its glorious past, magnificent landscape and its infinite variety. A beautiful hill temple, Palani is located at an elevation of 1,500 feet. 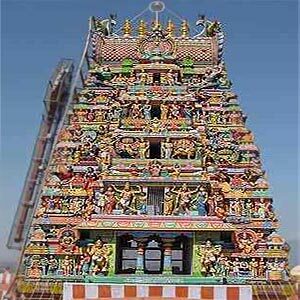 This temple is an ancient one dedicated to Lord Muruga. The deity of Lord Muruga in this temple is known as Dandayudhapani Swami. The idol of the Hindu God Muruga in Palani was created by Sage Bhogar. As the paste was a quick-setting one, the sculptor had to work swiftly to chisel its features. But he spent a lot of time in creating the exquisitely beautiful face that he did not have time to chisel the body in an equally good manner. The deity in this temple is in a standing position holding a staff in his hand. The Temple is located upon the Sivagiri hills. Access to the temple is by the 'yanai padhai' or elephant's path. This path was used by the ceremonial elephants. The other means of access is by the main staircase cut into the hill-side. For the past half century, funicular railway tracks have been laid up the hill for the convenience of the pilgrims. A rope-way car is also present. Saravana poigai near Thiruvavinangudi and the Shanmuga River are the sacred rivers of Pazhani (Palani). The devotees bathe here before worshipping at the Temple. Sage Narada when visiting the celestial abode of Lord Shiva at Mount Kailash presented Him a fruit, the gyana-pazham (fruit of knowledge). Lord Shiva wanted to divide the fruit between his two sons, Ganesha and Karthikeya. But Sage Narada stopped Him from cutting it as the fruit had to be consumed whole only. Lord Shiva decided to award the fruit to his son who was able to go faster around the world thrice. Accepting the challenge, Lord Karthikeya started his journey around the globe on his sacred bird, the peacock. But Lord Ganesha felt that his parents Shiva and Shakti were his universe and so went around them thrice. Lord Shiva awarded the fruit to Lord Ganesha. When Lord Subrahmanya returned, he got furious and decided to leave Mount Kailash. He then came to Palani. Being the abode of wisdom, the place was named - Pazham Nee or Pazhani/Palani. Sage Agastya wanted to take two hills namely Sivagiri and Sakthigiri to his abode in the South and asked his disciple Idumban to carry them. Idumban bore the hills slung across his shoulders, in the form of a kavadi one on either side. He placed the kavadi near Palani to take rest as he was fatigued. Subramanya, by then upset with his parents over the fruit issue came down to Thiruavinankudi (the foothills of Sivagiri hills). Lord Muruga settled there as a hermit in peace and isolation. When Idumban resumed his journey, he was unable to lift the hill. Lord Muruga had made it impossible for Idumban to lift it. In the fierce battle that ensued, Idumban lost his life but was later restored to life. Idumban prayed to Lord Muruga that whoever carried the kavadi (signifying the two hills) on his shoulders, while visiting the temple on a vow, should be blessed. Idumban also prayed that he be given the privilege of standing guard at the entrance to the hill. There is an Idumban shrine halfway up the hill where every pilgrim offers obeisance before entering the temple of Lord Muruga. Thai Poosam, Vaikhashi Vishakham, Panguni uthiram and Soora Samharam festivals are celebrated in a grand manner. Thai-Poosam is celebrated on the full moon day of the Tamil Month of Thai (15 January-15 February). Palani town is located 472 KM away from Chennai. The nearest airports are Madurai and Coimbatore. Palani is well connected by train and road.